The DaCast service is compatible with almost any RTMP enabled encoder, including the Teradek VidiU. This document is meant to get you up and running with your Cube. It assumes that you have already connected the device to a camera correctly and are now ready to start configuring the streaming aspect. 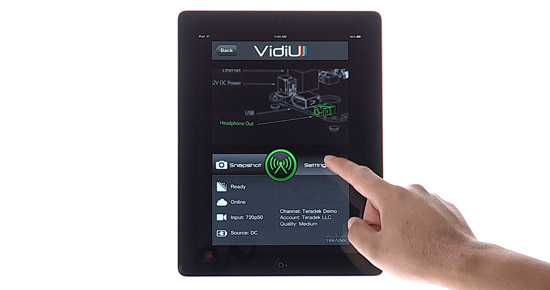 The images relate to the iOS version, although the VidiU contains a built-in web server that allows configuration of the device over Ethernet or Wi-Fi. There is also an Android App version available as well. Note that Teradek VidiU Mini and Teradek VidiU Pro can only stream to a single destination at a time. 1. Start up your VidiU and, from the device associated with it, click SETTINGS. 2. From SETTINGS click BROADCAST. 5. In your DaCast account, go to the live channel and then the ENCODER SETUP step. If you haven’t chosen a bitrate yet on this DaCast channel, do so now and click NEXT STEP. From the options, pick OTHER RTMP ENCODER. Now grab the STREAM URL listed there and place it in the URL field on the manual screen above. 6. Once more, from the ENCODER SETUP step on your DaCast account, copy the STREAM NAME information. Enter this into the STREAM field on the manual screen as shown above. 7. Because you are using an HTML5 All Device stream, you will need to enter a User and Password to proceed. *This username and password are found under ENCODER SETUP on the previous step, where you got the stream name and other information. Both will be a series of six digits each. You also need to change the “AGENT” field, seen above as Teradek, to FMLE. If you don’t make this change, you will see a “FAILED. Please verify username or password” message. 8. You can either save the profile, to make it easier to bring it up later, or simply click PLATFORM as shown above. 9. Don’t forget to click APPLY in the upper right corner. You are now ready to begin streaming using the VidiU and DaCast! To ensure the highest possible quality of your stream, you should set the keyframe interval at 2s. When using vidiU, however, the default keyframe interval is 2 seconds.